The spotlight will be on a San Francisco courtroom Wednesday, when climate science finally gets its day in court. The cities of Oakland and San Francisco are suing several oil companies for the costs of adapting to climate change impacts, such as rising sea levels that threaten to flood critical infrastructure. Judge William Alsup has taken the unusual step of asking both sides to present their views on the state of climate science. KQED's Molly Peterson will be tweeting live from the courtroom during Wednesday's hearing. Follow her at @Mollydacious and in special live online coverage from KQED Science. But it might not be the "great debate" that many are anticipating. Oil industry lawyers say they will not try to debate climate science in federal court during the hearing, but they will try to have the case thrown out. They've filed a motion to have the case dismissed, arguing that the courtroom is not the appropriate place to set climate policy. 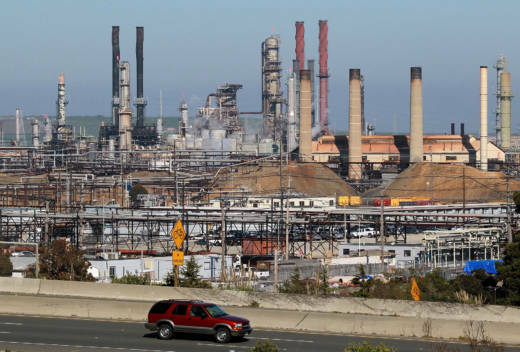 "The courts have said over and over again that public nuisance claims in court are not the way to go about solving global policy questions like global warming," Chevron lawyer Joshua Lipshutz told reporters in a Monday conference call. "They’ve all been thrown out of court." Lipshutz says Chevron supports the scientific consensus that burning fossil fuels like oil and gas is the leading cause of global warming. "That’s the established scientific consensus and from Chevron’s standpoint, there’s now no reasonable scientific debate about that conclusion," said Avi Garbow, who was general counsel at the Environmental Protection Agency under the Obama administration and for this case, Lipshutz' wing man at Chevron's outside law firm of Gibson, Dunn & Crutcher. "Chevron accepts that and that’s what it will present to the court in the tutorial." Both say their client will present "a neutral assessment of the science," based on a 2014 report from the United Nations' International Panel on Climate Change, which pegs greenhouse gas emissions from fossil fuels as the prime driver of global warming. But that in itself will raise questions that could prove vexing to the oil companies if and when the case gets any farther. "I think they’re in a little bit of an awkward position here," says Dave Owen, an environmental law professor at UC Hastings College of the Law in San Francisco. The judge has asked for a timeline of the evolving climate science, which Chevron lawyers say they will include. Legal experts say that could expose inconsistencies on the part of the oil companies and create an opportunity for plaintiffs. "If they say that this is the understood science and we knew it all along, then they are stuck trying to explain their earlier public statements and positions," says Owen. "And that could matter because one of the things the plaintiffs are trying to argue here is that these companies deliberately misled the public." Chevron's lawyers say they will carry the ball in Wednesday's courtroom "tutorial" for the defendants as a group, which includes oil giants BP and Exxon-Mobil. They say they won't be calling any expert witnesses, but as the oil companies downplay the drama, the significance of the event is undeniable.